Isn’t this a fun sketch! It is from the Cosmo Cricket Blog. And, if you create a card using Cosmo Cricket, the ‘prize’ may be a publication in Cards magazine! 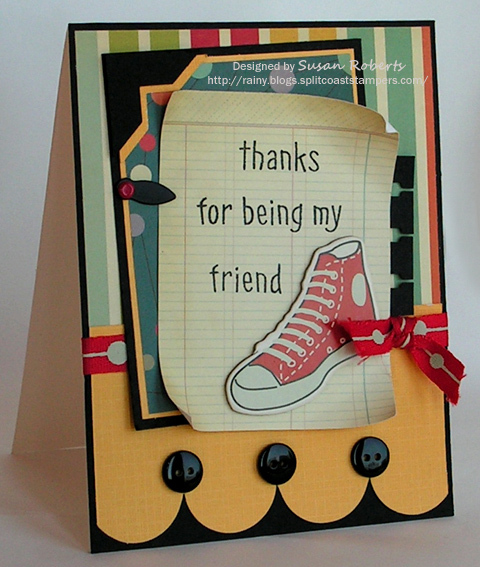 The designer papers used on this card are all from the Cosmo Cricket “The Boyfriend” collection. The ribbon and chipboard tennis shoe are also from this line. My sister is here visiting. Its always fun to catch up with her. We went and saw “The Help”. I highly recommend it. It’s one of those movies that stays with you as opposed to the ones that you have already forgotten about by the time you get to your car in the parking lot. Hope everyone has a great weekend. Happy Crafting!